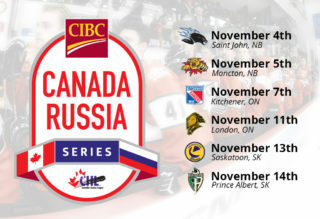 Game 5 of the 2018 CIBC Canada Russia Series goes tonight in Sherbrooke where Team QMJHL looks to re-take a lead for the CHL. Detroit Red Wings prospect Joe Veleno of theDrummondville Volitgeurs, New York Islanders prospect Noah Dobson of the Acadie Bathurst Titan, and 2020 NHL Draft prospect Alexis Lafrenière of the Rimouski Oceanic headline Team QMJHL’s Players to Watch. Sportsnet’s Sam Cosentino breaks down what to expect from all three stars.